Unlike the U.S. where most schools have running tracks, the sports field here in Fortrose, Scotland, is a grassy field. When I went running today, I got dive bombed by two seagulls. The birds repeatedly swooped down at head level and split the air with high-pitched shrieks and constant chortles, clearly angry. About halfway around the field, I discovered the source of their anger. 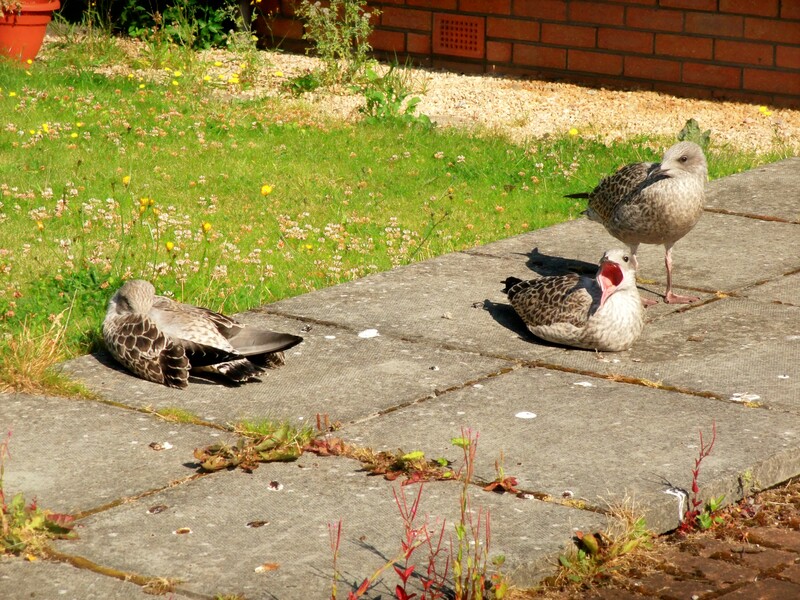 Three babies were sunbathing in the grass and attempting short, floppy bursts of flight. The parents were defending their babies. Oh, for human parents with the love, compassion and action to defend their children with the courage of those gulls. I must have outsized and outweighed those parents 50 to one, yet they were fearless when confronted by what they perceived as a threat to their young. Every human parent should follow the example of those gulls. Miz Mike, in my Sunpenny-published Christian mystery-romance-suspense Bridge to Nowhere, is Texan to the core – and kind. Her kindness evaporates when a kidnapper snatches her youngest grandson. When the kidnapper is finally captured, Miz Mike is on the culprit like ticks on a wild deer. A human version of protective seagulls. If seagulls, deemed “nuisance birds” by some, can be such loyal parents, why can’t humans? The label of “child abuse” shouldn’t exist because there should be no child abuse. Abortion is the ultimate form of child abuse. Action-centered, caring individuals flock to good causes: saving marine life; supporting no-kill shelters for dogs and cats; running retirement centers for horses; protesting the slaughter of wild animals to feed the fur industry; saving whales, trees and spotted owls. But where are those same compassionate activists when unborn children with beating hearts are impaled, sliced and diced and tossed into garbage cans like debris? Why aren’t some of these animal-loving humans speaking for unborn children who can’t speak for themselves? Why aren’t they demanding that unborn children be given the choice of life? As human parents, the choice is ours. Are we seagulls or baby batterers? Posted on August 2, 2013 by authorstephanieparkermckean •	This entry was posted in Uncategorized and tagged abortion, activitists, adoption, adventure, child abuse, Christian, mystery-romance-suspense, pro-life, running, seagulls. Bookmark the permalink.